The #1 accounting software for small business owners. The #1 accounting software around. We have every aspect of your accounting covered. Online accounting means all of your transactions are in one place. See the health of your small business directly from your accounting dashboard. Business accounting has never been easier. Instantly see how your business and cash flow are performing with valuable reports including profit & loss, expenses, and balance sheets. There are no more complicated Excel spreadsheets to worry about. You can generate financial reports at the click of a button. Increase your tax savings by linking receipts to expenses right from your phone. Come tax time, you’re organized and ready to file. QuickBooks Online is built by Intuit, the makers of TurboTax, so security is understood and integration is easy. 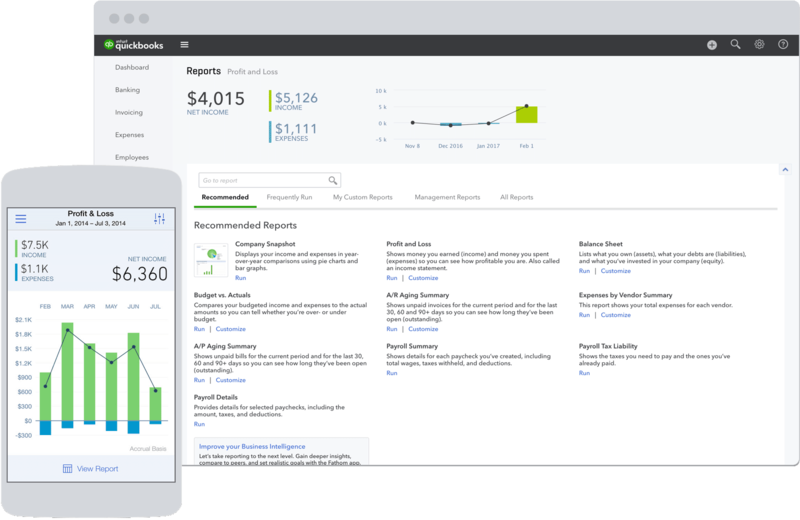 From invoicing to reporting and tracking expenses, QuickBooks does it all. Download our free mobile app to sync your data on your phone, tablet, and computer. Everything is there when you need it. Try QuickBooks for free with our test drive. You can also create your own account after signing up for a free trial. When we say free, we mean it. There is no credit card required to sign up. QuickBooks has built-in guidance to get you up and running. Questions along the way? Get your answers from our live support team or connect with your accountant directly through QuickBooks. Cloud accounting software for small business. QuickBooks organizes all of your accounting data in one central accounting system in the cloud and automatically syncs across your devices. Track sales and create invoices anywhere. Know how much you have in your bank accounts, what you owe, and what is owed to you at any time. QuickBooks’ cloud-based software allows multiple users to log in simultaneously and it keeps track of any and all changes through a detailed activity log. Give access to additional users so that your bookkeeper, accountant or colleagues can log in and work directly with your data online. QuickBooks uses advanced, industry-recognised security safeguards to keep all of your data protected. Organize your finances in one secure, automatically backed up place and work anytime and on any device. See an overview of QuickBooks and how it works. We’ve put together a comprehensive accounting checklist of the top 21 things every business owner should do to stay on top of their business finances. This is a must read for any business owner, no matter how new your business is. We go over all the basics that any self-employed person needs to know when it comes to accounting. Read this article to make sure you are staying on top of everything you need come tax time. You can limit stress at tax time by having the right documents for your accountant. We go over exactly what you need to bring with you once you’re ready to have your accountant help with your taxes.